When an alluring blonde with ties to the CIA disappears from a murder scene, Detective Lindsay Boxer turns to the Women's Murder Club to help her track down an elusive suspect: her husband. As she settles into motherhood and a happy marriage, Lindsay Boxer thinks she has found domestic bliss. But when a beautiful, alluring blonde woman with links to the CIA disappears from the scene of a brutal murder at a downtown luxury hotel, Lindsay's life begins to unravel. Before she can track down the woman for questioning, a plane crash plunges San Francisco into chaos and Lindsay's husband Joe vanishes. The deeper she digs, the more Lindsay suspects that Joe shares a secret past with the mystery blonde. Thrown into a tailspin and questioning everything she thought she knew, Lindsay turns to the Women's Murder Club for help as she tries to uncover the truth. 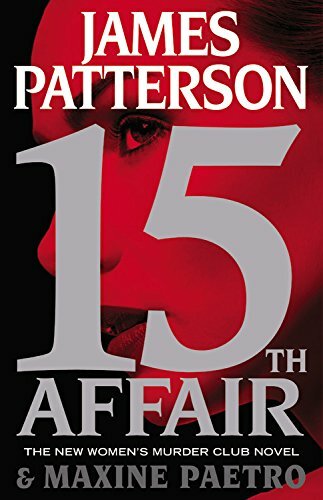 Filled with the pulse-pounding intrigue that has made James Patterson the world's #1 bestselling writer, 15th Affair proves that all is fair in love, war, and espionage.